There are some employees who go above and beyond to help a customer, even when it's outside of their job description. And when it happens in the food service industry, that kind of behavior stands out. Food service employees are some of the lowest paid in the USA, which is why it's almost always amazing when someone working at a fast food joint doesn't look entirely miserable at their job. While the instances of outstanding service are few and far between, there are still some people out in the world who won't let a crummy-paying job in a mostly thankless industry get in the way of them doing the right thing. 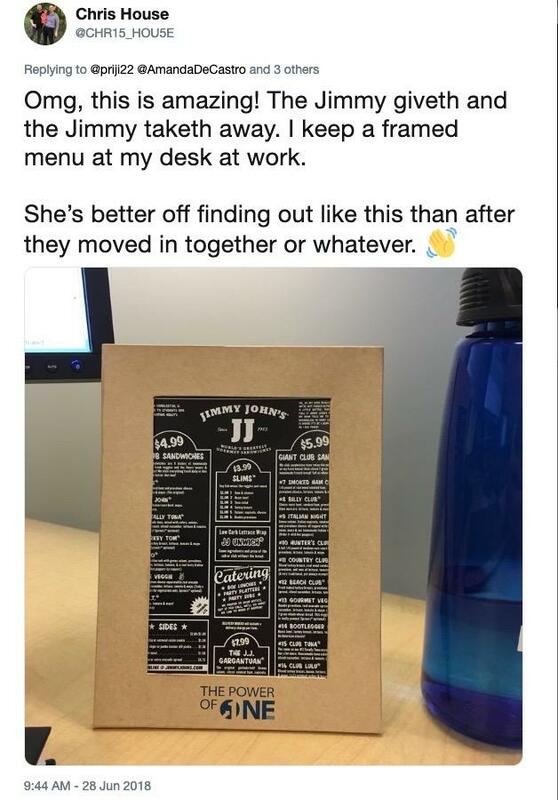 Something that this woman, Kayla, discovered when she ordered a Jimmy John's sandwich to be delivered to her boyfriend. 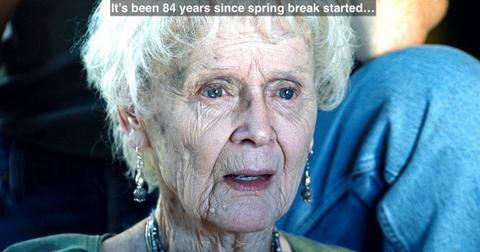 It was so incredible, she just had to share her experience. It all started out with a kind gesture: getting her significant other something to eat while he was getting his study grind on. They were in a long-distance relationship. 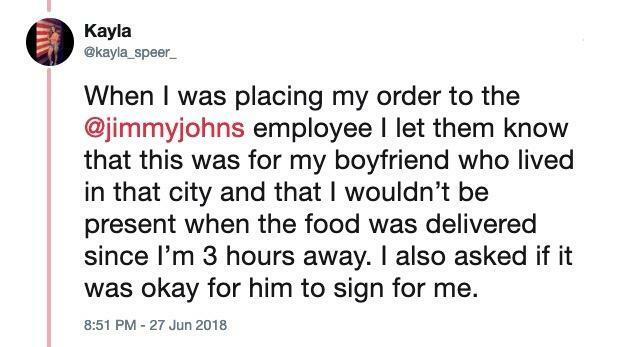 She let the employee know that her boyfriend would be the one signing for the sandwich, since she wouldn't be there. She sent him a text letting him know that the food was coming and that he should leave a tip, but he didn't respond. Probably because he was already taking a small snooze. This is when things start to get a bit weird. After she got a text from her boyfriend, thanking her for the surprise sandwich, she got a call from the restaurant. Strange, since the delivery obviously went fine. 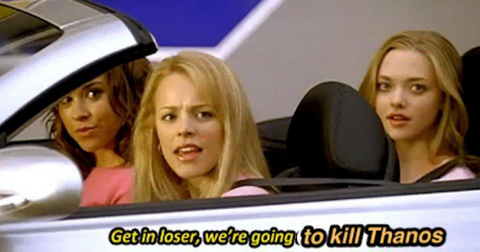 What could they possibly want from her now? 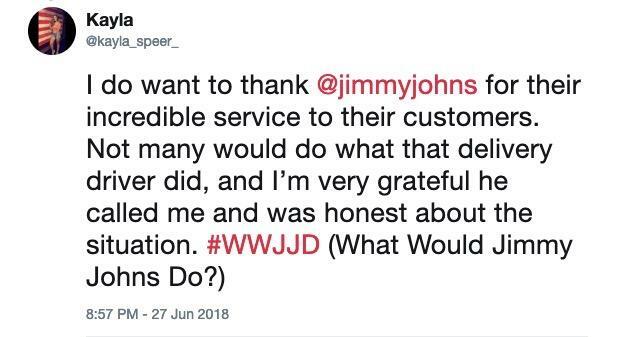 She had no idea why Jimmy John's would be calling it. She bought the sandwich. Boyfriend got the sandwich, transaction completed. No need for a follow-up call. 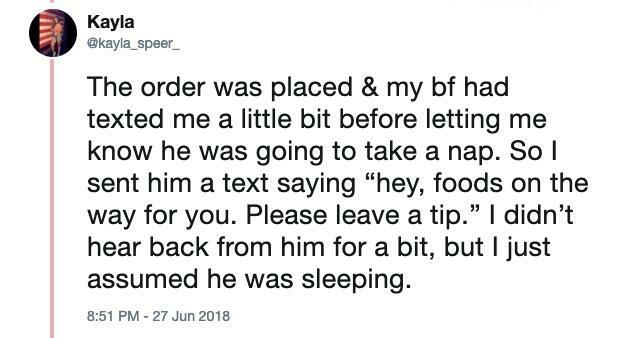 The driver wanted to reconfirm that the order was for her boyfriend, which she thought was weird because she had given them the rundown previously. But yet, maybe something got lost in translation between the order taker and the driver. That's when the bombshell dropped. Instead of taking a nap as he told her via text, it seems her boyfriend had some company and didn't realize he and his companion were on full display. 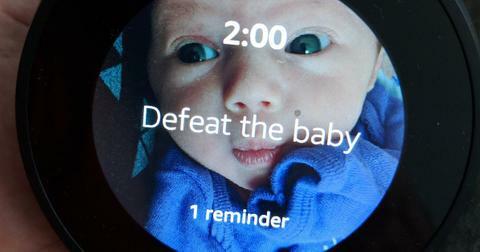 Obviously agitated, flustered, and all sorts of shocked, Kayla needed to make sure the delivery driver saw what he saw. And that the guy in question was in fact her boyfriend. He was. 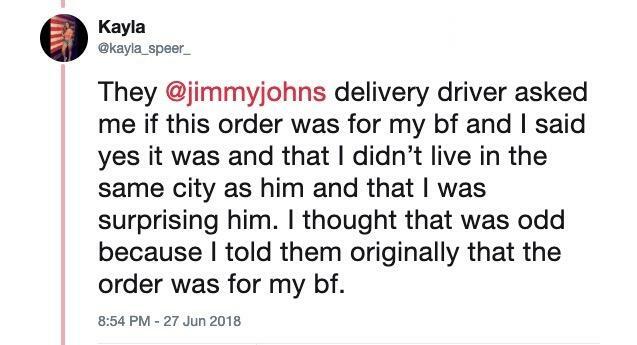 And Kayla was officially single thanks to a Jimmy John's delivery driver who wasn't afraid to speak up and let her know about the behavior. 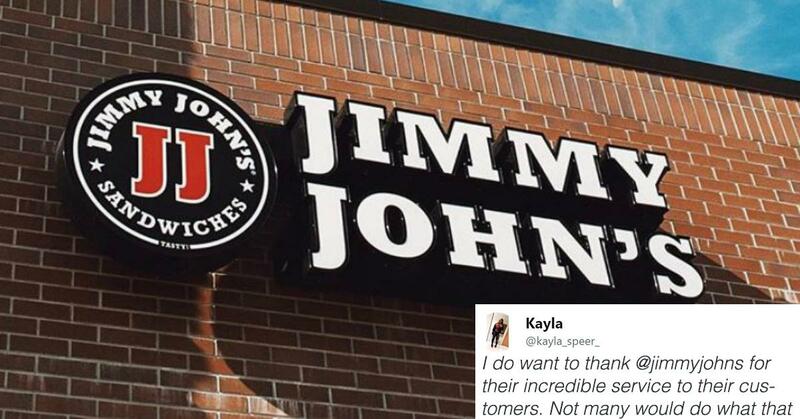 Kayla was grateful to the sandwich franchise, and made sure to "@" them in all of her tweets, thanking them for hiring an honest worker who went out of the way to let her know about her man's infidelity. People felt bad that Kayla had to find out that way, but they were in love with her story. We should all be so lucky to have complete strangers looking out for us like this. It turned already huge Jimmy John's fans into even bigger ones. This guy loves them so much he keeps a framed copy of their menu on his desk at work. If he had any other lunch plans this day, it's a safe bet he changed them after reading Kayla's story. 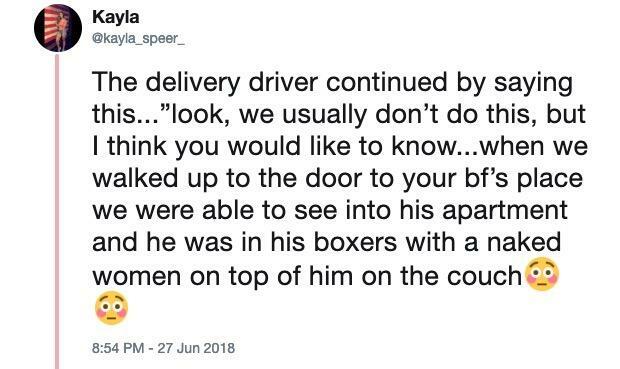 While others thought that the call from the delivery guy came from a personal place. 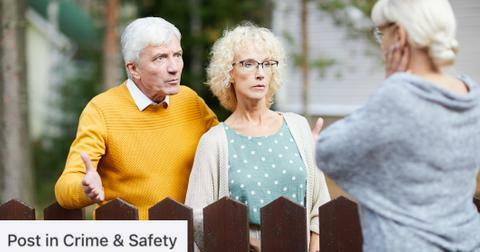 Those who've experienced the betrayal of a trusted romantic partner before have to look out for each other, after all.